At CHINAPLAS 2013, Huntsman Thermoplastic Polyurethanes (Huntsman TPU) introduced its full range of materials for different applications, such as shoes, cable & wire, consumer electronics, hot melt adhesive and automotive. 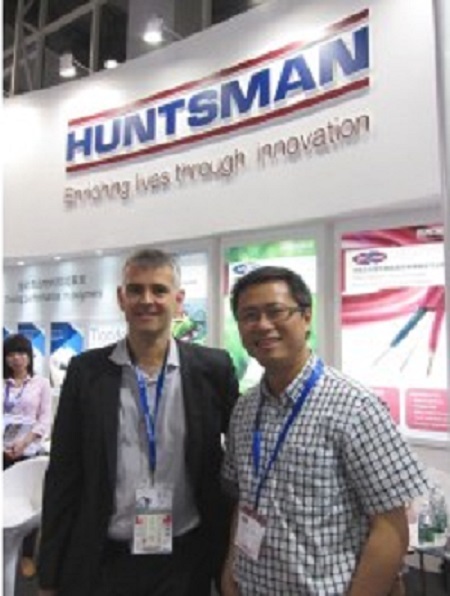 Stephane Peysson, Global Business Development Manager of Huntsman TPU, observed that there is a huge demand for high performance products in China. “The industry is moving away from cheap products.” He said. Mr. Peysson said cable & wires industry and electronic & electrical market are very important for Huntsman TPU because mobile phones, laptops, tablets are mainly produced in China. “Particularly in the consumer electronics market, there are lots of creative but demanding ideas. Our job is to meet the challenge and satisfy their ideas.” Added David Fu, APAC Commercial Manager of Huntsman TPU. Huntsman TPU provides enormous advantages for manufacturers, emphasizes Mr. Peysson. They are recyclable, do not contain halogen and produced with non-toxic plasticizer. “More importantly, it can enhance performance and design freedom.” He said. For example, Huntsman TPU helped to create both mat and gloss surface for shoes in one-time injection molding. Mr. Peysson revealed that the company is investing US$40 million to build a new Asia Pacific Regional Technology Center in Shanghai, demonstrating the company’s confidence in China and Asia. Meanwhile, the new TPU plant located in Jinshan, Shanghai is under construction and will be commenced within this year.